When’s the last time you read a book? The chances you didn’t read one during the last year have radically increased. For adults it’s roughly one in four — 24 percent according to the Pew Research Center. For my peers, youth, it’s about the same — 22 percent of 13-year-olds and 27 percent of 17-year-olds versus 8 percent and 9 percent, respectively, three decades ago according to the National Center for Education Statistics. That’s especially unfortunate considering literature can help young adults develop important critical-thinking skills. For instance, U.S. News & World Report recently listed book clubs among five useful tools for developing critical-thinking skills before college. My own experience with literature bears this out. In his best-selling novels “Jurassic Park” and “The Lost World,” Michael Crichton didn’t just take me on an entertaining roller-coaster ride. My favorite author reignited my childhood passion for prehistoric animals, sparked my intense interest in science, and continually fuels my own creativity. His novels underscore the importance of critical thinking. “Jurassic Park” gave me a perspective on how humans interact with the biological world and what we can do to alter things — especially with genetic engineering. While the story line shows how people can use science to do beautiful things and change situations for the better, it also demonstrates how we can make devastating mistakes. It’s probably no surprise that when my English teacher, Mrs. Hodgin, asked her classes at Moscow High School to participate in the Letters About Literature contest last year I wrote about the tangible, positive impact Dr. Crichton’s works have had on me. Sponsored by the Center for the Book in the Library of Congress, Letters About Literature encourages students in grades 4-12 to write a letter to an author — living or dead — whose book affected them personally. I was the State of Idaho’s winner for Level 3 (grades 9-12) last year. The $100 gift card I won funded a hobby that’s kind of turning into a career — raising and researching ants. Thus, Dr. Crichton hasn’t just fueled my interest in the natural world — in a way he’s also helping fund my exploration of it. The 2015-2016 Letters About Literature contest begins soon, and I encourage teachers and parents throughout Idaho to get their students involved. It’s an excellent project for classes and individual students. The Center for the Book in the Library of Congress begins accepting entries Nov. 2. They must be postmarked by Dec. 4 for Level 3 (grades 9-12) or Jan. 11 for Level 2 (grades 7-8) and Level 1 (grades 4-6). After the first two rounds of judging at the Library of Congress, the letters go through the next rounds back in their writers’ home states. The Idaho Commission for Libraries coordinates our local judging. 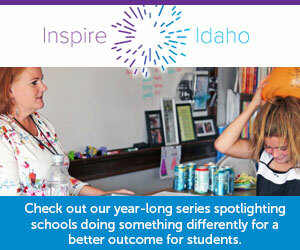 Learn more about it online at http://libraries.idaho.gov/lal. Meanwhile, if you, your child, or your students haven’t found a book that’s personally affected them, I urge you to resolve that. The benefits of literature are legion. Reading improves vocabulary, organizational skills, and the ability to read, comprehend, and analyze text. Plus, it can provide people with important historical perspective, encourage sympathy for other human beings, and promote appreciation for diversity and understanding of other cultures. Moreover, literature can help students develop the critical-thinking skills many employers think are lacking in today’s college graduates before they even get to college.